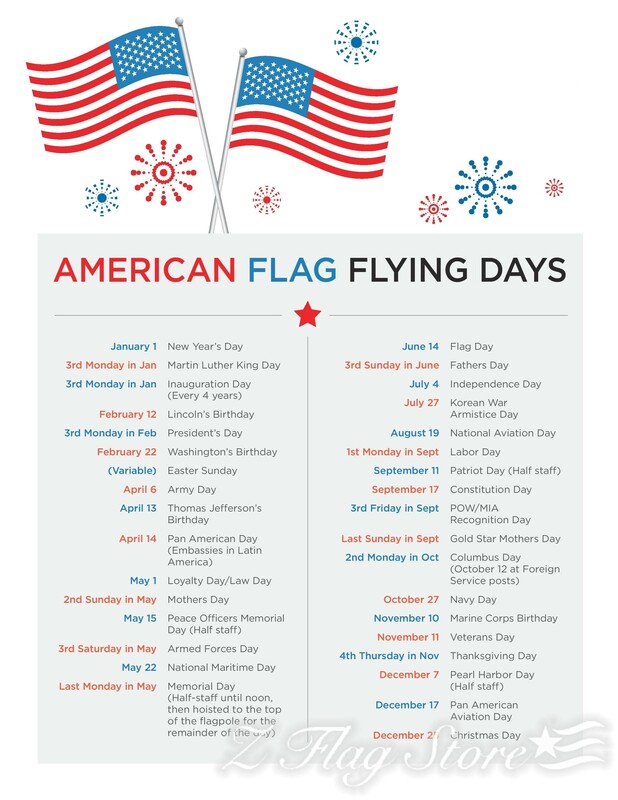 You should display the flag every day from sunrise to sunset, weather permitting. If you would like to display your flag at night, it must be illuminated. We have a great selection of solar lights that mount on top of the pole to ensure illumination. HOW LONG SHOULD I FLY THE FLAG AT HALF-MAST? The President may order the flag to be flown at half-staff to mark the death of other officials, former officials, or foreign dignitaries. In addition to these occasions, the president may also order half-staff display of the flag after other tragic events. When a half-staff order is issued, it will state when and how long the American flag or any state flag should be flown at half-staff. In any event, the flag should be briskly run up to the top of the staff before being lowered slowly to the half-mast position. During Half-Staff flag flying days, all flags should be lowered as stated. For flagpoles with multiple flags, remove any additional flags below the American flag that are suspended at or below the cleat on your flagpole for the duration of the half-staff order. This will eliminate the chance that one of your flags will be dishonored by touching the ground. The flag is to be flown at half-staff at all federal buildings, grounds and naval vessels in the Washington, D.C., area on the day and day after the death of a United States senator, representative, territorial delegate, or the resident commissioner from the Commonwealth of Puerto Rico. It should also be flown at half-staff on all federal facilities in the state, congressional district, territory, or commonwealth of these officials. to display one country’s flag above another. should be to the speaker’s right. the most common viewing point. The flag should never be used as wearing apparel, bedding, or drapery. It should never be festooned, drawn back, nor up, in folds, but always allowed to fall free. Bunting of blue, white, and red always arranged with the blue above, the white in the middle, and the red below, should be used for covering speaker’s desk, draping the front of the platform, and for decoration in general. The flag should never be used for advertising purposes in any manner whatsoever. It should not be embroidered on such articles as cushions or handkerchiefs and the like, printed or otherwise impressed on paper napkin or boxes or anything that is designed for temporary use and discard. Advertising signs should not be fastened to a staff or halyard from which the flag is flown.